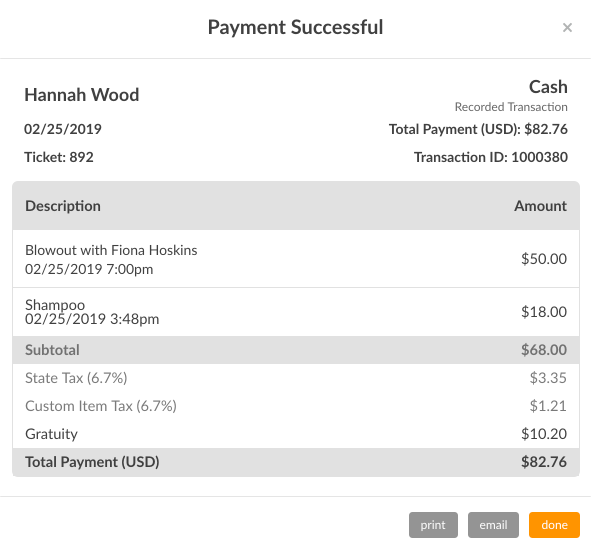 When a Package or Auto-Billing is applied at checkout, the appointment block will display the green "$"
If you're currently using our Payment feature, you'll notice some changes at Checkout, so keep an eye out for how much easier it is to keep track of client payments. 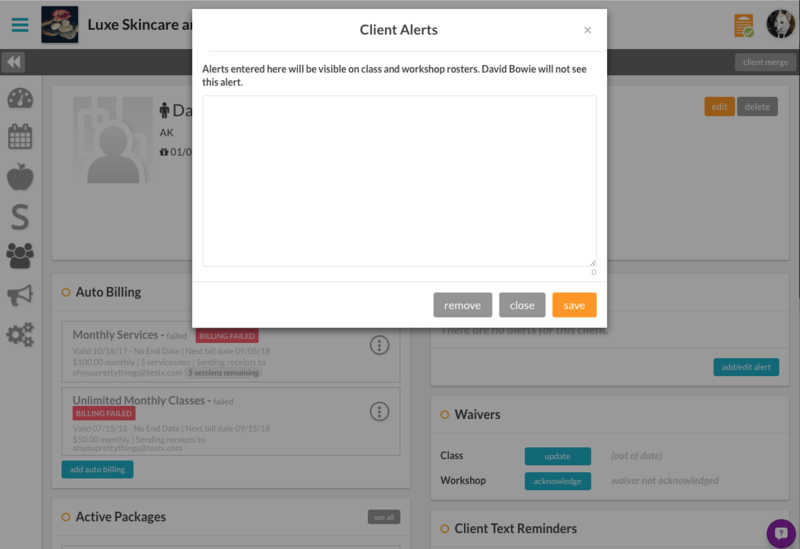 Client alerts anybody?! We now have a handy way for businesses to view pertinent information about their client from a roster for classes and workshops. We're pretty excited to share this with you! 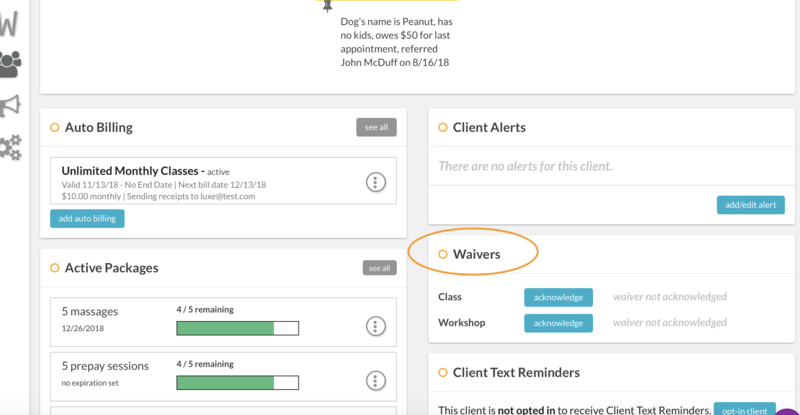 Businesses are now able to require a client to acknowledge a waiver at the time of booking or track them right in the client's profile. 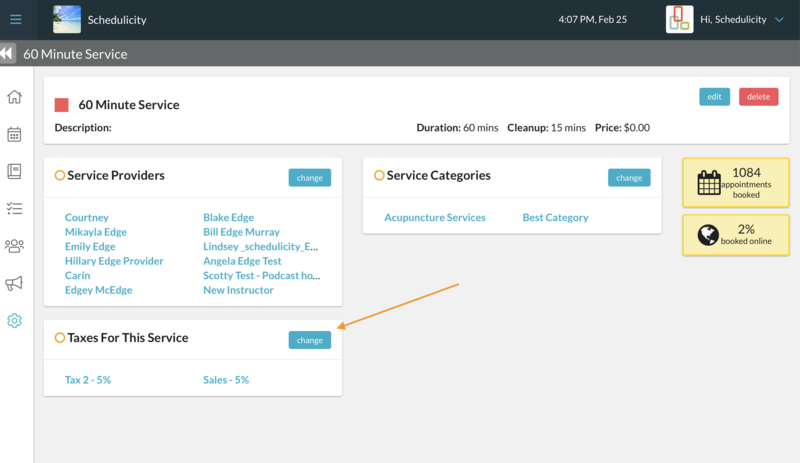 Directly on the session roster, our waitlist feature is an incredibly helpful tool that allows class-based businesses to ensure that their most popular classes are always filled even when they have some late cancellations. No more fielding phone calls for group bookings! Now, with our Group Booking feature for classes, clients are able to enroll themselves and others—all through one booking! You asked and we listened! We've updated the design for the workshop select screen to complete the client side redesign! The description, price, and run dates display on the workshop details. We removed the ability for business users to remove a service or course reservation from the checkout modal. We’ve gone ahead and removed the ability to edit the price per package when adding a packing during checkout. Are you an instructor that only offers classes and doesn’t fuss with one-on-one service-based appointments? Great news: we’ve made it even quicker to add classes and sessions to your schedule by eliminating that notice that announces that you might have some conflicts with your schedule! Now you can just make those appointments and get on with your busy day. We’ve gone ahead and made setting up classes even easier by automatically setting the default duration time for a class to one hour! One less thing to set up = marking one less class off the to-do list even faster. Have an enroll-all workshop that’s already started, but you still want to make it available for a few folks who have discovered it after the fact? With our new message, any potential students will still see that your workshop is on the table but will be prompted to call to schedule instead. This is visible on our client apps, as well! For those in need, we have “Support Group” as a new label in the Workshops area. Ever wonder when someone might have decremented a package or added another class session to balance things out? Wonder no more – now, your client’s Package History includes edits to their packages, as well! Add Schedulicity to your Instagram so clients can now book easily while browsing all your sweet pics! We just prettied these pages up to make them match our new Appointment Details page, it's all about consistency, right?! Want to offer special package deals for clients that are only available in the spring? Or maybe around the Holidays? Well- now you can! Heck, you can even edit existing packages to be a one-time purchase if you want! Haven't begun selling packages online yet? Check out our Payment add-on to start! We gave the client side class and workshop pages a facelift! The functionality of how to register for a class and workshop session hasn't changed, it just looks more up to date! Clients will be able to view which card they have on file, and can edit or remove it if needed. If their auto billing fails, they will get a notification email as well as a push notification! Great news! You'll now be able to view the full month of classes and workshops at a time, from the business side. There's a handy "print" button to print out this full month view. We added the ability to block new clients from booking online! This policy can be enabled on an account under the General Policies area! When it's enabled, there will be a "no new clients" banner on the client side. All clients will see that "(Business name) is only accepting bookings with existing clients. No new clients can book at this time." We've added the client's name to both the transaction details and the refund transaction details. The client's name will be listed at the top and will allow users to link to the client profile. We've added the ability to choose a start date when setting up an auto billing cadence for their clients. Clients are now able to bypass payment preferences based on the start date. With the ability to add an auto billing cadence to a client profile that has a future start date on the web side of things, we've added the ability to view those cadences from the iOS business app. The cadence will display like other auto billing with the newly added label of "not yet started." We are now displaying booked on details along with notifications details for classes and workshops within the enrollment details page. This information will display under the details of the class/workshop. We've added a filter for payment preferences to the service, classes and workshop lists for businesses who are using the payment add on. We also added the ability to quickly send text message directly from a client’s profile on the iOS business app! We've added color as part of editing multiple sessions at a time for classes. Businesses are now able to update the class color when editing multiple sessions at a time along with other changes. We've added the ability for a business user to update the class type from the edit class page. We added the ability to view and edit client notes from the class and workshop rosters. Businesses can add/edit up to 3000 characters and any edits made here will show on the client's profile. Due to feedback from class businesses using the auto billing add-on, we've added an auto-billing stamp to classes and workshops that gets applied at check-in. If the client has auto billing available but hasn't been checked in, the stamp will read "Auto billing available." Once the client is checked in, the stamp changes to a green check with "Auto Billing." We've added back in the prompt to clients booking with businesses who have the text reminder (SMS) add-on enable to opt-in to text reminders after they've booked with that business. We re-added the ability for call a client from the class and workshop rosters. If the user is on a desktop, "call" will open the default calling program (Skype, Google Voice, etc.). On mobile devices, it will call the client. We added a "last seen on" column to the exported client list. We've added the ability for an admin user to delete all tags at once from the client profile edit. We've added the option to send out Thank You emails only to your new clients! The default setting will be to send these messages to new clients only so if you'd like all clients to receive these messages you can quickly uncheck the box on the Thank You email setup page. 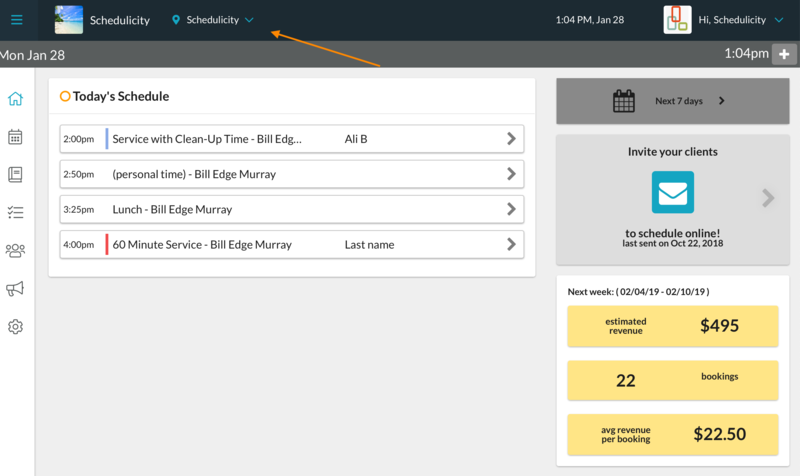 We've made it even easier to choose dates and times when booking an appointment from behind the counter. You'll also notice a list of suggested time slots based on your availability that day, making the process faster so you can get back to doing what you love. Super quick access to sharing your listing page or direct URL. For all of our Multiple Locations businesses, we've made a great adjustment to the change locations tab on your listing page. This is now easier to see and it includes the address for each location to make toggling that much more intuitive! Birthday: Clients have until the end of the month to use your birthday discount. They can book up to a full year out. Re-engagement: Clients have up to two weeks to use your re-engagement discount. They can book up to a full year out. These emails are sent out on the first of every month. Time to Book: There emails are sent out on Sunday mornings. We added a confirmation screen when disconnecting from Square or Stripe, to make sure folks know that disconnecting removes being able to keep client credit cards on file and to charge a client credit card. Adjustments made to make sure this page is as intuitive as possible and clients know to click "Book My Visit" to finish the booking process! We fixed lots of bugs! It is now easier to edit your business listing! Added client package history to the iOS business app. Added package expiration to the iOS and Android client apps when a client is buying a package during the booking process. Added the ability for a business to specify whether their employee is created as a provider or as a front desk user when setting up access for multiple locations. Added the ability to specify a default expiration date when creating a new package or when editing an existing package. Added the ability for a business user to view auto billing information on a client’s profile from the iOS business app. Added the ability for a business to decrement the service subscription for Auto Billing during the checkout process in the iOS business app. Updated the design of the My Preferences page for a client logged in user account. Updated the design of the profile overview page for editing and viewing information. Increased the size of the change locations dropdown menu for multiple location businesses on their business listing. Updated the "Naturopathic/Alternative Medicine" industry category to "Integrated Medicine." Added the ability for a business to set up, edit, and cancel an active subscription for services with the Auto Billing add on. 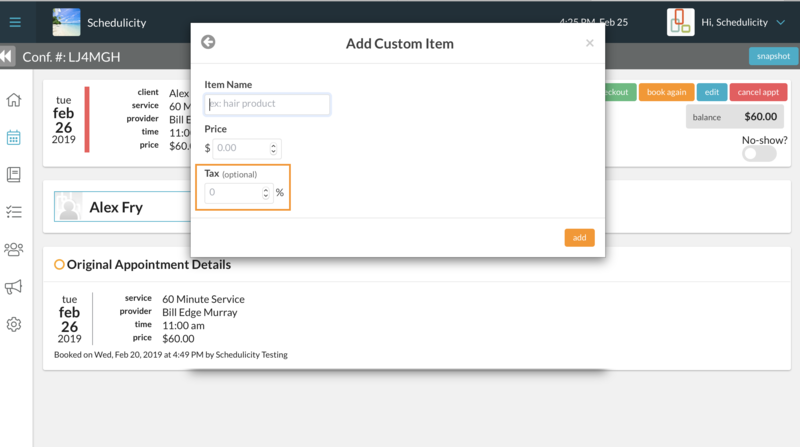 Added the ability for a business to decrement the service subscription for Auto Billing during the checkout process. Added the ability for clients to book a service with an active subscription through the website, the iOS client app, the Android client app. Added an indication to the appointment details for auto billing applied on both the website and the iOS business app. 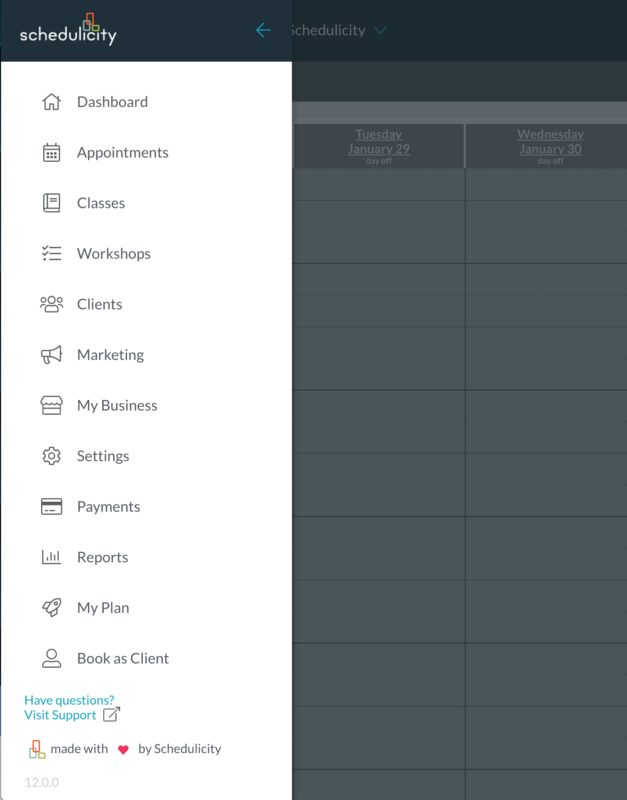 Added the ability to book a service with an active subscription through the Android client app. Updated the iOS business app and the iOS client app for iPhone X changes. 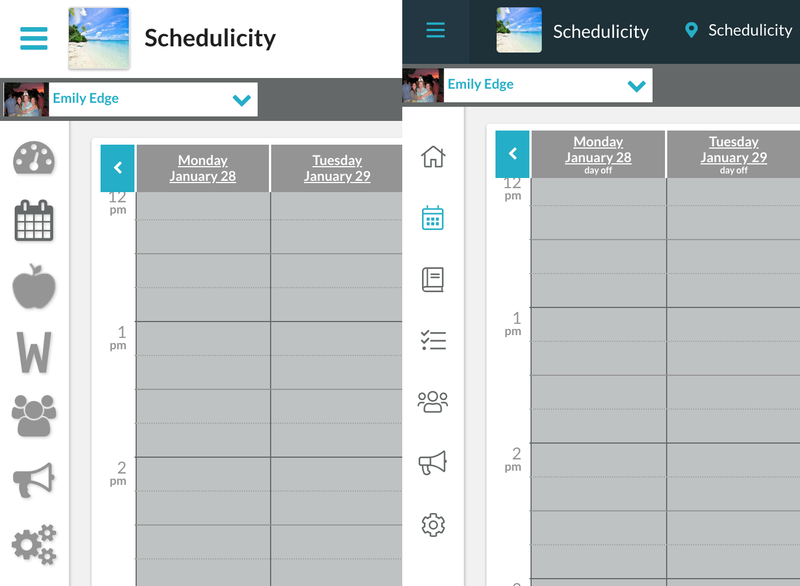 Added Fill My Book deal scheduling to the Android client app. Updated the design of adding a new class or workshop.